3RD DISTRICT: Scott Angelle Is A...Hamster? 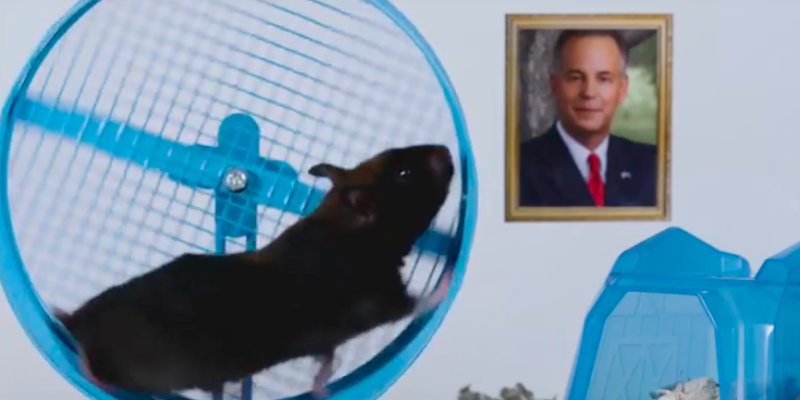 3RD DISTRICT: Scott Angelle Is A…Hamster? Compared to last year’s governor’s race, the upcoming 3rd district election must seem like a cake walk for Scott Angelle. But the sleepiest of sleepy races got a little heat Wednesday when Lafayette’s Gus Rantz was shown in a video featuring Scott Angelle as a hamster (I think). In a quick 30-second clip, Rantz attacks Angelle on a few issues that might be familiar if you can still remember last year’s election for governor. Today, the Gus Rantz for Congress campaign launched a new television ad entitled “Hamsters,” which compares Rantz, a conservative business leader and political outsider, to former Democrat Scott Angelle, a 30-year career politician who has used his clout to cash in and hand out favors to his friends and family. The ad continues, discussing Angelle’s political history, including the tax raises he imposed on St. Martin Parish residents while serving as parish president, as well as state contracts he gave to members of his family while in office. In 2007, Angelle used his power as secretary of the Louisiana Department of Natural Resources (DNR) to give a contract to a company in which his sister-in-law was a part-owner. In 2010, the state Board of Ethics blocked Angelle, then serving as lieutenant governor, from allowing his brother-in-law to receive state contracts. The ad also covers board positions Angelle has received over the years, which have earned him hundreds of thousands of dollars. Since 2012, Angelle has served in an advisory position on the board of directors of Sunoco Logistics, an oil and gas logistics company whose business Angelle had oversight of while in his role as head of DNR. This position pays Angelle nearly $390,000 a year, and his main duty is to attend the board’s meetings. Rantz, the primary conservative alternatives in the race, and Angelle are leading the 3rd District field in fundraising and money spent during the campaign season. With the launch of this ad campaign, Rantz is continuing his anti-establishment “FED UP with Washington” message, while also shedding light on Angelle’s history as a lifelong politician only interested in advancing his career interests. We’re not sure if Rantz is actually in second. Polling, as said above, is spotty, but it may be that former St. Landry Parish sheriff’s deputy Clay Higgins is ahead of Rantz for the runoff spot opposite Angelle. A funny ad hitting the frontrunner at a perceived weak spot could perhaps change the race, however. David Vitter made many of the same attacks on Angelle during last year’s governor’s election, but there’s no way to tell how this is going to affect voters. It’s surprising the Bayou Corne sinkhole incident wasn’t mentioned, which has also left Angelle vulnerable in the past. The purpose of the ad is obviously to position Rantz as a political outsider. Problem is there are lots of those in this race, and the one who seems to be closest to Angelle has a badge, gun and Youtube following. Next Article Have You Seen The Nike Cubs Ad?